Saint Hemma is also sometimes called Saint Emma. Both of Saint Hemma’s parents died when she was very young, and she was adopted by the emperor of Germany. She married an important man and became a powerful woman, but she suffered a lot. Her children died young and her husband was killed. 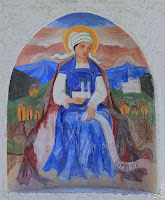 With her family gone, Saint Hemma used her money to help the poor and to build monasteries and churches. Today, make pretty church “windows” like Saint Hemma would have put in the churches and monasteries she built. 1. Use the template to cut out 2 frames of a cathedral-shaped window. 2. Lay the waxed paper flat on your work surface. 3. Paint a little glue on the waxed paper and then stick a piece of tissue paper on it. Continue to add tissue paper, overlapping the pieces, until your waxed paper is mostly covered. Make sure all the edges are glued down. Allow to dry. 4. Use the template to cut the waded paper into the cathedral window shape. Glue it between the two black frames. 5. When dry, punch a hole in the top of the window and use string to hang it in your own window. Saint Hemma, pray for us!